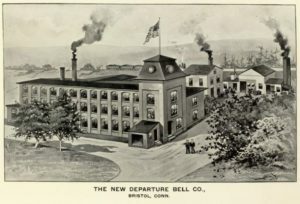 In 1888, Albert F. Rockwell and his brother Edward moved to Bristol, Connecticut, founded the New Departure Bell Company, and started manufacturing doorbells. Their business prospered and they soon diversified into the production of bicycle bells and brakes. After they renamed the business the New Departure Manufacturing Company, the brothers began making ball bearings for use in expensive automobiles. By the time Albert F. Rockwell retired in 1913, the company was shipping its bells, brakes, and ball bearings all over the world. In 1914, shortly after his retirement, Rockwell gave the city of Bristol 80 acres to develop as a public park. (He later added about 15 more.) 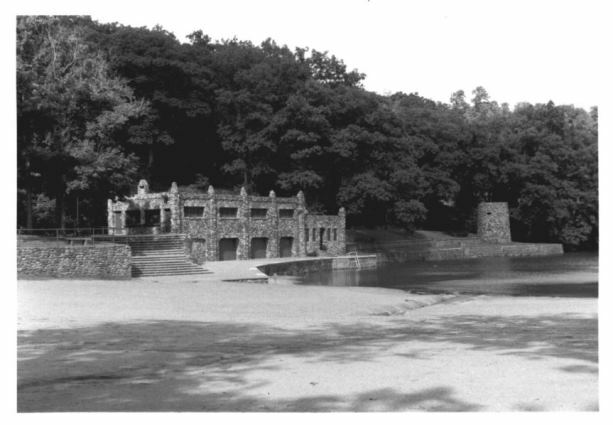 The park was designed by the Boston landscape architect Sheffield Arnold and completed in 1920. 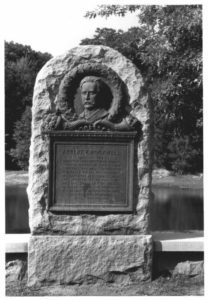 (In addition to Rockwell Park, Arnold designed Stanley Park in New Britain and the campus of the Loomis Institute (now Loomis-Chaffee) in Windsor.) The Bristol property, left largely in its original wooded state, soon attracted scores of local nature lovers. In addition, Arnold’s design provided winding drives and an excavated lagoon with a bathing beach and bathhouses. The park quickly became a popular venue for company outings, barbecues, clambakes, and band concerts. While Rockwell focused on the natural environment, his wife, Nettie, took a special interest in the children’s playground. Nettie purchased the most modern equipment available for the playground, which an early article described as “the best of its kind to be found anywhere.” Following her husband’s death in 1925, she continued to provide financial support for the park, and she left the Bristol park system a generation endowment upon her own death in 1938. In 1987, Rockwell Park was added to the National Register of Historic Places as a prime example of early 20th century landscape architecture. Sadly, by that time the park had begun to fall into disrepair. The lagoon had been partially filled in and the area around the pool had reverted to wetland in some areas. When swimmers came down with a mysterious rash because of the poor water quality, authorities drained the facility’s remaining water. Vandals then took to spray-painting the historic bathhouse and other structures. In 2004, the city of Bristol commissioned a master plan to renovate the park and to bring its outdated facilities up to date. The city hired Milone & MacBroom, Inc., a civil engineering firm in Cheshire, to oversee the project. 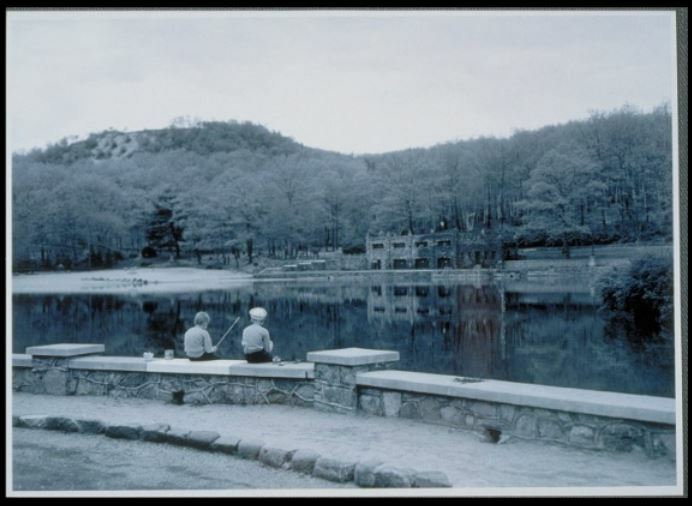 Like the park’s original architect, Milone & MacBroom had extensive experience with landscape architecture in Connecticut. The firm reconstructed some original features of Rockwell Park, including the original park drive and the stone bridge across the Pequabuck River. New parking areas and sidewalks emerged, along with new ornamental stonework and period-style lighting. The lagoon was partially restored, but the wetland was retained and an elevated boardwalk added. Mrs. Rockwell’s playground also received a thorough overhaul. New age-specific play structures were constructed along with a skatepark and a splash pool. Today, Rockwell Park hosts outdoor concerts and festivals, marriage ceremonies, and sports activities. The 21st century has witnessed a resurgence of interest in outdoor recreation there, and the park now offers a BARC Park for dog walkers and classes for mountain bikers. In 2011, Milone & MacBroom received a Design Merit Award from the Connecticut Chapter of the American Society of Landscape Architects for their work on Rockwell Park. 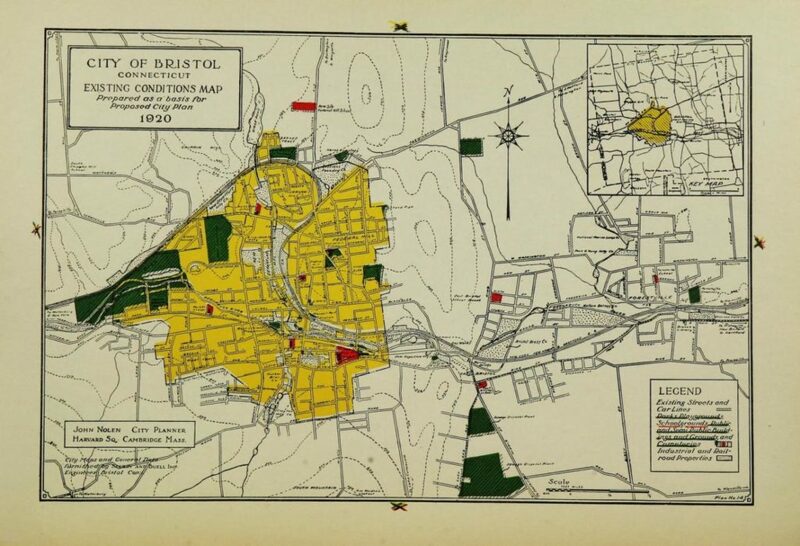 “City of Bristol, Connecticut, Existing Conditions Map Prepared as a Basis for Proposed City Plan, 1920” published in Local Survey and City Planning Proposals for Bristol, Conn. by John Nolen, 1920. “Reconstruction of Historic Rockwell Park, Bristol, Connecticut: Landscape Architecture by Milone & MacBroom, Inc.” LandscapeOnline.com, 2016. Link. “Bristol Historical Society,” 2017. Link. “Rockwell Park.” City of Bristol, Connecticut, 2016. Link. “National Register of Historic Places Inventory - Nomination Form: Rockwell Park.” National Park Service, 2016. Link. Peck, Epaphroditus. A History of Bristol, Connecticut. Hartford, CT: Lewis Street Bookshop, 1932. Nolen, John. Local Survey and City Planning Proposals for Bristol, Conn. New Britain, CT: Adkins Printing Co., 1920. Link.